Summary: In order to allow for a real estate transaction to be completed, Brickhouse managed and documented the proper closure of three large underground storage tanks formerly used for retail sale of gasoline. The closure report was approved by PADEP and allowed the transaction to proceed in a timely and efficient manner. As part of a real estate transaction, Brickhouse Environmental was retained to provide project management, environmental assessment, and closure reporting as part of the decommissioning of a gasoline service station. At the time of Brickhouse’s involvement, the station was no longer in operation, and the proposed new owner had no plans to return the station to an operational facility. Alongside our partner and certified storage tank handler, EMG Remediation Services, two 15,000-gallon underground storage tank (USTs) and one 10,000-gallon UST were removed and closed in accordance with the Pennsylvania Storage Tank Regulations. 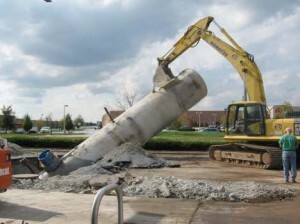 All product dispensers and piping associated with the storage tank system were removed, along with the demolition of the dispenser island canopy. Post-closure soil samples were collected in accordance with applicable regulations and submitted for laboratory analysis. Brickhouse Environmental monitored and documented the closure utilizing a photoionization detector (PID). All post-closure samples met applicable standards, and a storage tank closure report was submitted and approved by PADEP. The proper management, tank handling, and reporting provided for a smooth transition in a timely manner with no unexpected surprises. Work was completed on budget to the satisfaction of all parties involved.